Visit our project gallery for more beading ideas. People just learning to make jewelry are always looking for more bead jewelry patterns. Using patterns when you first start out makes you more confident to later make your own bead designs. The most basic piece of jewelry you can "make" is a pendant on a purchased chain, leather strap or other necklace. Just go to the store, pick a pendant you like and a necklace you like. Put them together and you've just made your first bead jewelry project! That may seem a little bit like cheating, but it's instant gratification, and you really did make it yourself. The next-most-basic bead jewelry "pattern" is using a single bead to make your project. You can use all the same color bead, or simply all the same type of bead in different colors. Actually, it would be a good idea to try both. The next step is to do some beading with glass beads. Again, you don't really need a pattern for this one. Buy a tube of assorted glass beads in a colorway that you like, plus some heavy-duty beading wire. You could use a leather or rubber cord if your beads have big enough holes. String the beads on in whatever way you like, this time adding a spacer bead between each glass bead. The space makes each bead look distinctive, and they make the necklace a little lighter since they weight a lot less than the glass beads. Now that you've made a few hodgepodge necklaces, you're ready to bring a pattern into your work. 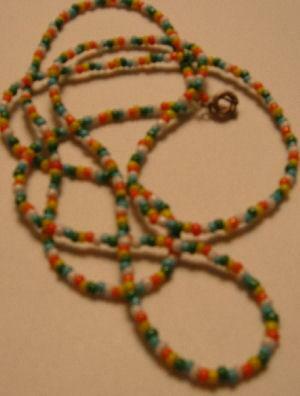 Start with a very basic pattern such as five beads of one color and one bead of another color. You can pull your "pattern" from anywhere: your children's birthdays, your street address, any number that has meaning to you, or even a random number. This is a cool idea for a gift. If you're making something for someone's birthday, use their birthdate as a guide. Say their birthday is June 11, 1976. You would use six beads of the same color followed by 11 of another color, then one, nine, seven and six of something else. Put in a spacer or a different bead to mark the end of the pattern and repeat as many times as you need. Now's the time to start experimenting with mixing different kinds of beads. What happens when you use seed beads and glass beads together? How about polymer clay and wood? Pony beads and silver? Once you've gotten to this point, go to the store and buy beads you have no particular use for. When you get home, play around with the beads and see what "pattern" you can come up with. The worst that can happen is you don't like it and you lost a little bit of beading wire finding that out. Experiment and feel free to make mistakes. The next step in learning about beading jewelry is making a multi-stranded necklace. This isn't any harder than making a single-stranded necklace, but it does take longer and look more impressive. The only special tool you will need to make this project work is a necklace closure that has loops for more than one wire. Make each thread a slightly different length so they don't all bunch up together on your neck. You'll probably want to use light beads on this project until you know how strong your neck is! For many people, earrings are the most advanced bead jewelry pattern. That's because you have to make two that match. They aren't really that difficult, though you need to have some wire-working tools to make drop earrings. Again, you can start very simply by using pre-made pendants that match. All you'll need to do is attach a jump ring to the pendant and the earring mount so that the pendants will hang the right way. After you've mastered that, you can make your own pendants out of head pins. Just buy a couple of matching pins, string on your beads, and wrap the end of the pin so that the beads are secure and there's a loop in the top to thread onto your earring mount. Use any of the pattern ideas above to make matching earrings. Once you've worked through this series of beading jewelry basics, you'll be ready to come up with your own designs and work on more challenging projects.